In states that are not swing states U:RESIST supports Jill Stein of the Green Party, (jillstein.org) because real change will not happen without strengthening alternative voices, such as those advocating for peace, civil liberties, and a green economy. Democracy Now! 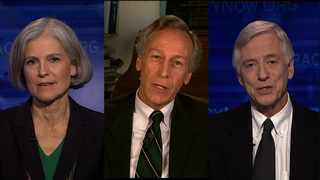 's special broadcast in conjunction with the final Presidential 2012 Debate featuring Jill Stein of the Green Party and Rocky Anderson of the Justice Party. On many issues, Barack Obama has been further to the right than even our most extreme right-wing Presidents, including Richard Nixon and Ronald Reagan. The corporate media and Republicans keep saying that Obama is going to take away your guns, but the truth is that he has been extremely lax on gun laws. Just as the so-called "government takeover" of healthcare is actually a continued corporate control of healthcare, Obama has supported the Charter School Movement to privatize and close public schools (a Milton Friedman dream), even though research shows that children are clearly left behind in the process. In terms of negotiations, he has even said that, "everything is on the table", including cuts to our social safety net, something that even Nixon realized was off limits. And, in response to the economic crisis, he didn't reinstate the very badly needed Glass–Steagall Act, which separates commercial banks (consumer oriented) from investment banks (speculative), to ensure they won't gamble with our retirement, essentially protecting Main Street from Wall Street. Even the Volcker Rule of the Dodd–Frank Wall Street Reform and Consumer Protection Act has an exception for the largest financial institutions, rendering it practically useless. Nixon had the EPA, but now with climate change looming, Obama has gone further than just not supporting necessary climate initiatives, he has obstructed international climate accords, only to ensure that the private interests of a wealthy few are upheld, over the interests, health, and safety of the world population. And now, the war agenda is not Republican driven, but is fully and equally owned by the Democrats. The President may have ended the war in Iraq (not the occupation), but also had worked to extend it, only to be pushed to end it by a date originally set by Bush. We also should be very concerned about a President with a kill list, and the likelihood that it will be passed on to future leaders. The unlawful prison at Guantanamo Bay remains open, along with U.S. secret prisons around the world. War crimes and torture haven't stopped, only the opposition from democrats. At least under a Republican administration, Democrats are against war. Even though Mitt Romney would be worse, we can't fool ourselves any longer into thinking that we have a liberal president. 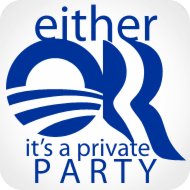 Although, unlike Mitt Romney, Obama can be, and even wants to be pushed to do what's right for the people. So ultimately, it is up to us. Because Romney would be so much worse, U:RESIST supports voting for Obama in swing states (rootsaction.org) but in return, sending a message by voting for (a real candidate for change) Jill Stein (jillstein.org) in all of the states that are not swing states. Don't worry, ...the day that the Green Party has enough influence to turn an election in a state that is not a swing state, that will truly be a day of real hope and change, that will cause positive political waves far greater and more important than a win or loss from either corporate party.